My business trip to New York just started. The weather in NYC was surprisingly "okay". It wasn't too hot or humid. After checking in at the hotel, I took a walk for a while. In the evening, I met up with my business partners who flew all the way from Japan. I was so excited to see them here! Despite the long travel with 12-hour time difference, they looked rather refreshed than tired. 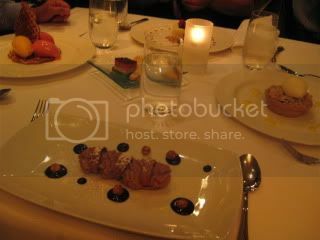 We had our kick-off dinner at ESCA, which is Mario Batali's seafood restaurant in Midtown West. The restaurant has such a nice ambience. It's a very busy restaurant, just like any other Mario's places. We did their Tasting Menu. I didn't take pictures of all the food, but every dish was so well presented and excellent. Amuse Buche...bruschetta with white beans. It was great with Summer Ale by The Blue Point Brewery from Long Island. Crudo del Mercato...The first course was 4 different kinds of crudo including Mediterranean pink snapper and skip jack. The quality of each was exceptional! Burrata...Soft cheese from Puglia with Spoonbill caviar. We all gasped when Burrata appetizer was presented in front of each of us. 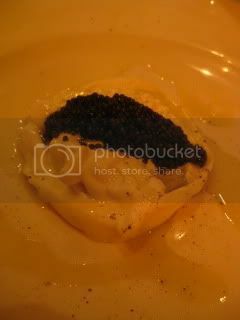 It was a huge wad of burrata (from Puglia) with a generous (really generous) scoop of caviar (domestic spoonbill caviar). And, the combination of the flavors worked out really nicely. Linguine Fine...with Gulf shrimp, sungold cherry tomatoes and guanciale. A Japanese friend who had been to ESCA told me that this restaurant does their past right. She was right! The pasta was spotless with al dente doneness and the flavor was really nice. Salmone Serlvatice...Wild Yukon River sockeye salmon with cucumbers, marscaponne and dill. We all got our salmon medium-rare. Very pure flavor. Merluzzo...Roasted Casco Bay cod with Italian spigarello. 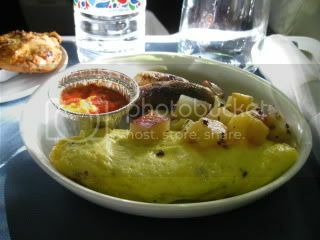 I loved the simple and sophisticated preparation of this dish. Before dolci, we also had ricotta cream (almost like ice cream) with wild flower honey. So nice. 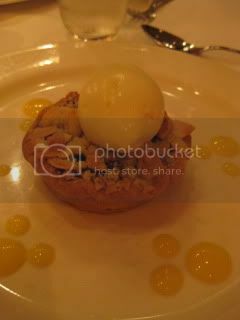 Dolci...we shared 4 different kinds including Crostata di Mirtillo (blueberry crostata with toasted almonds, lemon curd and creme fraiche gelati). Very nice, and we were very full. 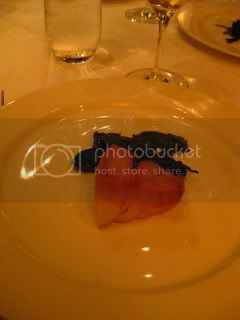 Wines complemented the nice seafood dishes well, too. We had 2010 Clelia Romano, Fiano di Avelliono "Colli di Lapio" (from Campagna. young promising producer. vinified entirely in inox. very clean and floral. ), and also 2007 Sardus Pater, Vermentino "Lugore" (from Sardegna. growing co-op. rich and elegant). Wonderful first night dinner! Portion of each dish was quite big for a tasting course, so we were really full after all the dishes and wines. We had such a nice time together. Tomorrow, hard work will begin!